The date was August 7, 2005 when Michael Taylor was fishing Silvermine Lake, one of Harriman State Park's Seven Lakes chain, near Sloatsburg, NY. Michael was using a purple worm with 8 pound test line. He had just cast next to a big submerged rock when the big bass hit his bait. After a hard fight the fish was quickly weighed, photographed, and released. The big bass weighed in at 6 and half pounds. Michael says the fishing has always been good in the Park, but it seems it is getting better year after year. The two primary species of bass inhabiting N.Y. State waters are smallmouth and largemouth bass. Both species may be found in most all of the states lakes and rivers. The average bass caught is between 1 and 5 pounds, but there are many fish taken every year over 5 pounds. Bass fisherman by majority are a catch and release group so that affords this species a bit more protection than they would other wise receive. 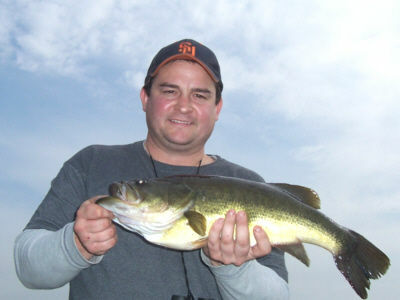 The state wide size limit on bass is 12 inches in length and a daily creel limit of 5. Open season on bass is the 3rd Saturday in June through November 30th. The state record largemouth bass was caught by John L. Higbie he was using a spinnerbait fishing in Buckhorn Lake on 09/11/87. This majestic fish weighed an amazing 11 lb. 04oz. The state record smallmouth bass was caught by Andrew C. Kartesz on Jig and Grub Tail from Lake Erie on 06/04/95. This incredible fish weighed 8 lb. 4oz.